Jo Haldeman, the widow of President Nixon’s chief of staff H.R. “Bob” Haldeman read selections from her new memoir In the Shadow of the White House: A Memoir of the Washington and Watergate Years, 1968-1978. Mrs. Haldeman described her book not as a history of Watergate, nor as a biography of her husband, but as her story. The timeline of her book covers a ten-year period from Richard Nixon’s presidential nomination in July 1968 to the day Bob Haldeman was released from prison in December 1978. Larry Higby, Bob Haldeman’s assistant chief of staff, introduced Mrs. Haldeman. First Lady’s Dinner Party: In March 1969, Jo Haldeman attends a dinner party for White House wives. She finds the new environment and protocol intimidating. Her husband says, “just follow the other ladies…. Do what they do. I’m sure you won’t be the only one there for the first time.” After dinner, she meets a “stately” older woman standing alone and introduces herself. “I know who you are, my dear,” the woman says, extending her right hand. “I’m Mrs. Warren.” “It’s nice to meet you,” Mrs. Haldeman replies. “Is your husband part of the Nixon White House?” “No, dear, he’s the chief justice of the Supreme Court.” Mrs. Warren smiles pleasantly and drifts away. 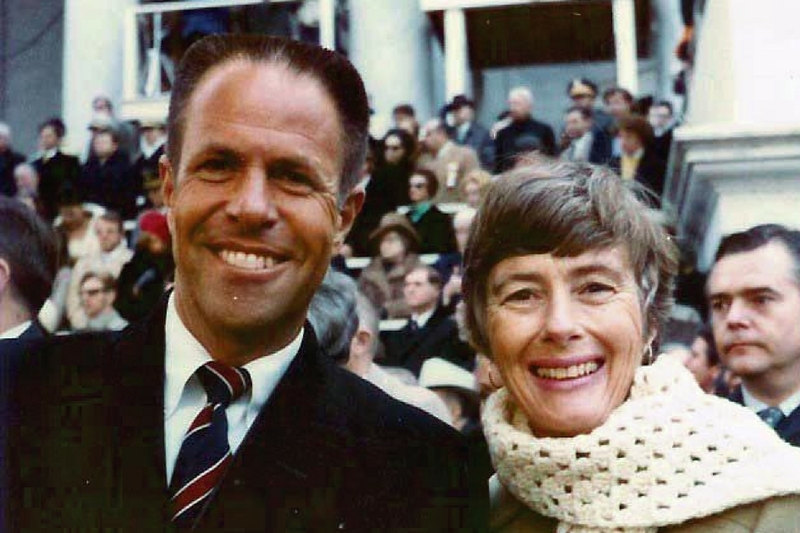 Heroic Swim: In January 1971, Bob and Jo Haldeman accompany some White House staff members to the Virgin Islands where President Nixon is spending a long weekend. During one day trip of sailing and snorkeling, Bob Haldeman and assistant Larry Higby remain on-call via short wave radio, and receive a message from the President who needs them back on shore. One hundred yards from land, the wind dies, and both men decide to jump ship, swim toward the beach, and run for their parked jeep. Resignation: On April 29, 1973, Mrs. Haldeman retrieves The Washington Post and reads that former White House Counsel John Dean reportedly is ready to swear that he gave both Ehrlichman and Haldeman progress reports on the Watergate cover-up. Later in the day while the press is swarming outside their home, the phone rings, and as Mr. Haldeman predicted, he has to go to Camp David where the President will ask for his resignation. Handleman: Mrs. Haldeman and her mother-in-law, who they called “Non,” visit Mr. Haldeman for the first time during his 18 month sentence at the Federal Prison Camp in Lompoc. As soon as they are cleared by security, he is notified over the loudspeaker, “Handleman, you have a visit.” Non responds, “They didn’t get the name right! How will Bob know it’s for him?” “Don’t worry, Non, he’ll know,” Mrs. Haldeman responds. The three sit at a table on the patio, and Mr. Haldeman talks about life at the camp and what his work assignment might be. Order signed copies of In the Shadow of the White House here.